The death toll in this week’s massive earthquake that toppled buildings in Mexico City and elsewhere rose to at least 305, the country’s national civil defense coordinator said, as rescuers continued to look for those trapped in the rubble. Luis Felipe Puente, the coordinator of national civil defense, said Saturday on Twitter that more than half of those killed, 167 people, died in Mexico City. Several people were found alive on Thursday, the Associated Press reported. 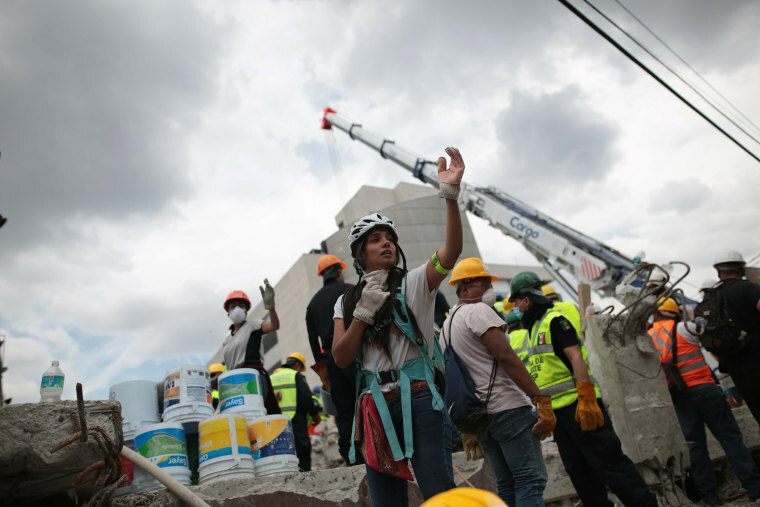 In Mexico City's Colonia Obrera neighborhood, cheers erupted from more than 1,000 volunteers and officials after they pulled a survivor from the rubble of a textile factory Thursday. But the work to find survivors quickly resumed. Mexico's Navy said Friday that 115 people have been found alive by rescuers in Mexico City. Mexico said 1,300 of its marines have been deployed to help, and volunteers, aid workers and officials have traveled from all over the world to Mexico to help with the recovery effort. The magnitude-7.1 earthquake struck at around 2:15 p.m. ET and the epicenter was in the state of Puebla, southeast of Mexico City, the U.S. Geological Survey said. It occurred on the anniversary of the country’s deadliest earthquake that struck in 1985 and killed 9,500 people. "The search and rescue actions will continue until they have exhausted all the possibilities," the Navy-Secretariat of Mexico said in a statement Friday. Puente said that in addition to the 167 killed in Mexico City, 73 died in Morelos, 45 were killed in Puebla, 13 people died in Mexico State, 6 died in Guerrero and one death was reported in Oaxaca. At Mexico City's Enrique Rébsamen school, 11 children were rescued and 19 children and six adults were confirmed killed, officials said. Those who witnessed the buildings collapse said the tragedy could have been much worse. Some buildings didn't fall immediately, giving people time to escape, and some shattered but left airspaces where occupants survived. In other cases, the salvation seemed almost miraculous. Security guard Felix Giral Barron said that after the quake started, he had time to run and tell people to evacuate his building. Then an entire apartment building across the street crumbled and a big tank of heating gas on its slid off, but didn't explode. "The 550-pound (250-kilogram) gas tank got caught by the trees on the street, and that prevented it from exploding," he said.